In stock 13 pcs. Also available in our walk-in store. Basic sewing necessities in a handy little roll pouch. Although the Italian workmanship shows, these are perfectly fine sets. Measurements closed about 7 x 12 x 5 cm. These look untouched. The contents may vary a bit though. Esbit- keitin mahtuu tähän pussukkaan. I've used a repro of the WWI British Hussif. This is miles of improvement. Love it, and plan to use it for years to come. Edit: GF loved mine so much, she wanted her own. - sisältö kannattaa päivittää paremmilla langoilla/neuloilla, muuten hyvä ostos! Ei maksa juuri mitään ja sisältää tarvittavat ompeluvälineet muummoassa hanskojen korjaamiseen ja kauluspaidan säätämiseen. Esimerkiksi SA kauluspaidasta tuli sopivasti istuva tällä ompelusetillä! Pussukkaan mahtuu vielä paljon lisää ompelutarvikkeita. 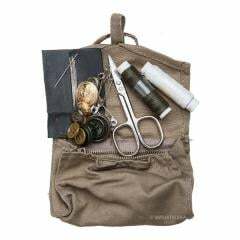 Great little kit to keep with your gear for repairs away from home. Costs pennies compared to what these essentials would cost bought separately at a store. Just add some larger needles and button/upholstery thread for really tough repairs and you're all set. Very handy little kit, great value for money. Needles, two lots of thread, metal and plastic buttons, safety pins, scissors, and a couple of unidentified small metal objects. All in a nice little pouch. Cannot fault it for the money. Great little kit for the little wallet. Have it in my bag for quick-fixes. Great little kit for the price; mine in particular seems to have been untouched, with two good sized spools of thread (one green, one white, both have 50 metres of thread), some plastic buttons of various sizes (all on a loop of thread) as well as some brass buttons along with a good pair of scissors (in need of some lubrication). The kit also came with ample safety pins and a pair of fairly small, round metal objects of unknown purpose. The kit also came with a good number of needles with varying sizes. Only real quality issue is that the needles arrived with some rust on them, but this is a fairly trivial issue and I can easily rectify it. Everything in the picture was included. Some rust on the scissors. But for €2 you stuff extra's in it as needed. I bought it for the bag that easily fits in a kit when travelling abroad. Received a nice kit with all described. Only issue is the zipper is stuck in place, and no amount of WD-40 will move it. Hopefully that changes, but if it does it'll be a 5 star for certain. Zipper freed up after awhile, really amazing just how much this kit has! Plenty of spare needles, all wrapped up, scissors, thread, buttons, the perfect pocket kit for repairs while hiking or otherwise in the outdoors! And they're dirt cheap! to keep collar etc. up first aider...Scissors are rather good., but don't forged to oil them, after the nickel coating is of those goes - rusts in a second.. If you are super human, you can put the the thread throught needles eye in camp fire with cold fingers... I'm not so I addet a threader in this kit. Handy little kit. If you can get yourself a Bundeswehr one. But it fits the needs. The first thing you'll need to repair with this sewing kit is the sewing kit itself. But for $1.99, one can hardly complain. An extremely handy piece of kit very happy with the quality and condition. Matkalle mukaan, kaikki tarpeellinen vaatekorjauksiin kentällä voipi ite lisäillä sopivan värisiä lankoja mukaan. I have managed to perform all the sewing I've needed to do, only with this kit. One minus star for the threads condition; at least my threads were old and somehow worn out, so it couldn't handle a hard pull when sewing. 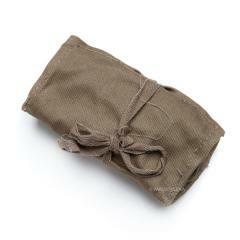 So I'd recommend you to get some good-quality threads in addition to this little pouch. great price, quality product, neato carrying apparatus. splendid little emergency sewing kit. Halpa ja hyvä setti. Neuloja, lankoja, nappeja, hakaneuloja, sakset..... kaikki mitä tarvitsee kun nappi lähtee irti tms. Osa neuloista oli hiukan ruostuneet, mutta sehän on ymmärrettävää kun käytetty setti on. Quality and state of contents seem to vary between kits, but I seem to have lucked out. Both the pouch and the contents were basically like new. For a couple bucks, it was a steal. For those wondering, since contents seem to vary a bit, mine included three bobbins of thread - red, green, and white, - several buttons of various designs, a few metal rivets which is a bit puzzling since you'd have no tool to put them on, a plethora of safety pins in every size I could think of, and two sewing needles, one smaller one and one larger one. It's by no means a complete kit or a whole slew of stuff, but for the price getting even all the individual contents, let alone together, in a little pouch, would be challenging. Definitely worth the money just to get the contents, let alone the pouch. The pouch itself was immaculate. Kind of had the smell something fabric does when its dusty and has laid around for a long time undisturbed, but other than that it was fine. Zip opened without problems, the material is sturdy and had no stains or wear. Basically like new. The zipper *is* a cheapy one, and if you get a kit that has problems that;'s probably going to be your problem, I imagine. I carry this in a pouch on my belt since the machine shop I work in likes to massacre clothes apparently, and it's already gotten put to work. I added myself some pieces of fabric for patches, but beyond that, it's had everything I'd need. Great piece of kit to have can’t bet the price was fully stocked and the scissors are stainless! * Turn one into a little EDC utility kit. Victorinox pocket knives, BIC lighters, Fisher space pens, small Soviet army combs, USB sticks, ear plugs and plenty of other handy knick knacks fit in these nicely. * Use your imagination for the others. Fire starting kit, fishing kit, whatever you need. 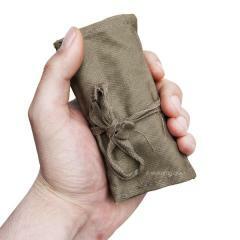 No, they're not half as well-built or hard-wearing or tacticool-looking as a proper EDC pouch from Maxpedition or Tasmanian Tiger, but they do the job and are ten times cheaper! Use your Italian sewing gear to attach some different coloured bits of fabric to each pouch so you can tell them apart without opening them - or just label them with a Sharpie. If you really wanted to, you could upgrade them a bit by cutting off the tie-up wraps and sewing on some elastic loops or velcro or whatever. Don't forget to wax them up for waterproofing! You can easily stuff half a dozen of these in the pocket of a windproof smock or the smaller side of a Finnish gas mask bag. These are just super handy, and for 2 Euro you couldn't even buy the zipper, fabric and binding to make one of these yourself. Stock up while you can! It contained every item advertised. The only drawback is that the German one feels better made, but for 2€ drop it in your shopping cart and get yourself a sewing kit, because I'm willing to bet that you don't own one.